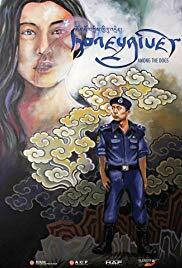 In this “Buddhist noir” an undercover detective (Kinley) investigates the case of a missing Buddhist nun and falls into a risky alliance with his only suspect, Choden, an alluring woman known as the village “demoness.” Kinley slowly realizes that Choden’s stories of historical dakinis (enlightened Buddhist women of power and wisdom) might provide the very “clues” needed in understanding the investigation, yet first he might have to surrender to both her charm and a belief in the supernatural. Dechen Roder is one of the first female directors from the Kingdom of Bhutan. She has been making small shorts and documentaries since 2005. Her most recent short film Lo Sum Choe Sum (3 Year 3 Month Retreat) competed in the Berlinale Shorts 2015, and later screened in multiple festivals around the world, including Palm Springs Short Fest, Melbourne, Fribourg, and Seoul International Women’s Film Festival. She is also the co-founder and organizer of the only film festival in Bhutan, Beskop Tshechu Film Festival. When not working on her own films, she works as a visual editor on other projects and as a producer/writer/director for commissioned projects. Honeygiver Among the Dogs is her debut feature film.